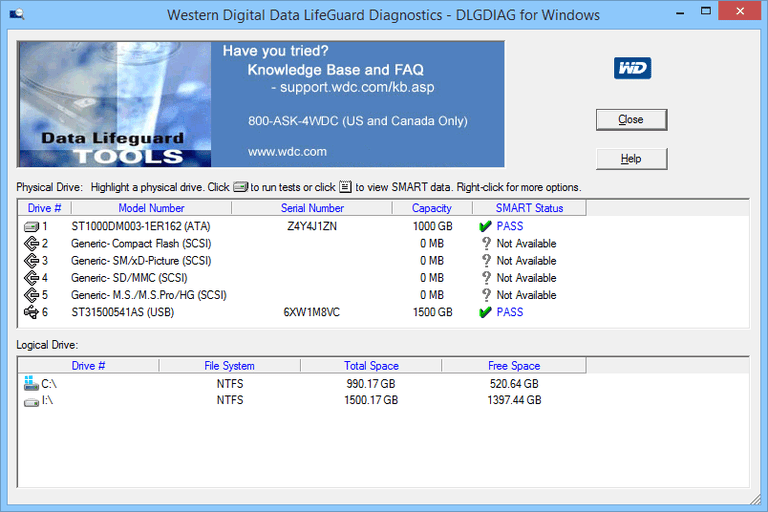 Western Digital Data LifeGuard Diagnostic (DLGDIAG) is a hard drive testing program that can either be run as a standard program from within Windows or put on a flash drive for booting before the computer starts up. DLGDIAG for Windows can run diagnostic tests on internal and external hard drives of any manufacturer, which means you don't need a Western Digital drive to use the Windows version. DLGDIAG for DOS is operating system independent, meaning it works no matter what is installed on the hard drive, but testing is only available on Western Digital hard drives. Downloads are from Softpedia and Western Digital's Wdc.com. See our Download & Install Tips guide for more information. This review is of Western Digital Data LifeGuard Diagnostic for Windows v1.36, which was released October 2018, and DOS v5.27, released October 2016. Please let me know if there's a newer version I need to review. You might need to replace the hard drive if it fails any of your tests. Western Digital Data LifeGuard Diagnostic for Windows works on both 32-bit and 64-bit versions of Windows 10, Windows 8, Windows 7, Windows Vista, and Windows XP. To get started, just download the installation file, which comes in ZIP format. Then unzip it with a file extractor and run the setup.exe file that's contained within. Install it like you would any other program, choosing Next throughout the installer. You can most likely unzip the archive without needing any third-party file extractor programs, but I recommend using 7-Zip if you do go that route. The bootable program is called Western Digital Data LifeGuard Diagnostic for DOS, and is a text-only program, which means you can't use your mouse to navigate around it. Don't worry that it says DOS — you don't need DOS or need to know anything about it to use the tool. The bootable version requires a bit more work, but is great when you don't use Windows or can't get in for some reason. Download the installation file, also in ZIP format, and extract it. Once that's done, see these instructions for getting the files onto a flash drive — just copying them there won't work. DLGDIAG for Windows is easier to use than the DOS version but they can both perform the exact same functions, with the exception of the Windows version being able to view Self-Monitoring, Analysis, and Reporting Technology (SMART) information. Another difference is that the DOS version of Western Digital Data LifeGuard Diagnostic requires the primary hard drive be a Western Digital drive before the program will work. The Windows version, however, doesn't have such a restriction. The Quick Test option in Western Digital Data LifeGuard Diagnostic performs a relatively fast self-scan while an Extended Test checks the whole hard drive for bad sectors. The Windows version lets you view the results on the screen while the DOS version lets you print the results out. Both versions of DLGDIAG can also be used to wipe a hard drive by overwriting the drive using the Write Zero method of data sanitization. The portable version for Windows is extremely easy to use and understand, clearly showing a pass or fail marker for the SMART status. The fastest way to start a scan is to double-click a drive from the list to show further options like the quick or extended scan. I also like that you can read the model number and serial number of each device. When selecting a hard drive to work with using Western Digital Data LifeGuard Diagnostic for DOS, you can view the serial number only. It's after you blindly select one of the drives and you return to the main menu that it displays the hard drive capacity, which is helpful in determining which drive you want to work with. These downloads are from Softpedia and Wdc.com. See Download & Install Tips for more information.